There’s little doubt that the demand for HIT professionals is soaring. Various estimates, including one from the Bureau of Labor Statistics, project the need to be roughly 50,000 people to fill openings. For those seeking to enhance their prospects, gaining certification could be a difference maker. The HIT Pro and the Certified Health Informatics Systems Professional (CHISP) competency exams are two options available for fledging HIT professionals. Both exams aim to validate an individual’s knowledge and understanding of critical concepts and skills in the HIT field. Exactly which exam is the best fit depends on current career standing and career goals. With more hospitals and health networks moving into the EHR adoption phase, it’s becoming increasingly important for job candidates to be able to prove themselves as being qualified to handle the challenges. Offered by the American Society of Health Informatics Managers (individuals must be ASHIM members to sit for the exam), CHISP designates a qualified professional as capable of meeting the needs of hospitals and physician practices as they adopt EHRs. The exam, which costs $260, indicates that a professional has met a defined skill set of core competencies needed in the HIT profession regardless of career path. A three-hour timed exam, CHISP features 250 multiple-choice questions designed to evaluate healthcare regulations, computer science, medical insurance billing, data security, medical terminology and anatomy, operational principles in healthcare, data mining, and technology in quality of care. When the HITECH Act became law, requiring hospitals and healthcare affiliates to convert to EHRs, it was obvious to most observers that the HIT workforce would need to be strengthened. From there, the idea for the HIT Pro competency exam was born. In conjunction with grants being offered to community colleges to train students in a specific HIT function, the exam is part of the Health and Human Services’ Workforce Development program and aims to confirm students are ready to meet the nation’s need for more HIT workers. Besides confirming newcomers’ knowledge, the exam is also valuable to existing HIT professionals as a means to validate their knowledge. 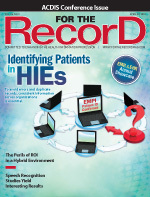 “It is important that professionals with health information credentials have a way to validate their body of knowledge so that employers can recognize them as true leaders as we begin to embrace a conversion to EHRs,” says Kay Gooding, MPH, MAEd, RHIA, project director of Region D’s HITECH workforce training program. Unlike CHISP, the HIT Pro exam is workforce-role driven, focusing on the following six occupations: clinician/practitioner consultant, implementation manager, implementation support specialist, practice workflow and information management redesign specialist, technical/software support staff, and trainer. The exams are intended for individuals who have been trained through a short-duration, nondegree HIT program or are existing members of the workforce with relevant experience.